, and that it was even more pronounced in the US. It shows the issue is a global problem potentially misleading marketers about the platform’s reach, particularly in markets where Facebook has a high penetration of users in the population. The United States had the largest discrepancy with Facebook estimating it could reach 19.3 million more users in the 20-29s age bracket than the 47 million that actually exists (see chart examples below). Accounting for short-term visitors not covered by population wouldn’t come close to closing a population base the size of the greater New York metropolitan area. 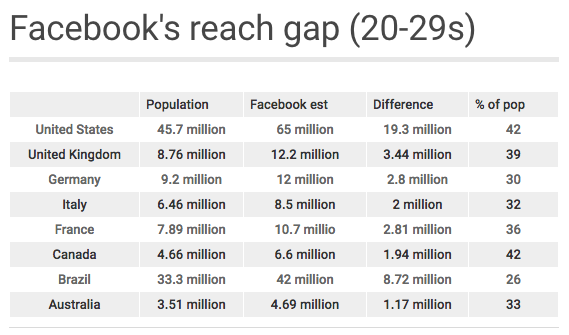 In the UK, Facebook’s reach of 20-29s was 3.4 million more than the population, and sizeable gaps were also found in Brazil (8.7 million), France, (2.8 million), Germany (2.7 million), Italy (2 million) and Canada (1.9 million). The difference ranged between 26% to 42% of population figures. A common pattern among affected markets is that Facebook audience estimates rise sharply in the 20s, where they peak, and then slowly trend down until they fall below population figures in the 40s and beyond. This means its claimed reach for millennials, a valuable advertising demographic, are questionable. The markets where Facebook did not exceed population data were Japan, South Africa and Russia, where there are proportionally fewer users. A country’s population size didn’t matter. 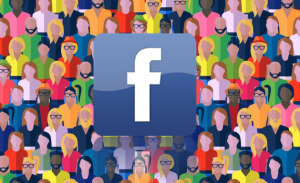 AdNews tested out Iceland and found Facebook’s reach exceeded population for all age demographics until the 40s. Facebook has stated that its audience estimates are not based on population data and may be affected by short-term visitors in a location, as well as users lying about their age. Facebook only charges advertisers for actual reach that it achieves during a campaign. The issue is important from a planning point of view because the size of an audience and how you work out the cost for an audience are often factors in planning a campaign. 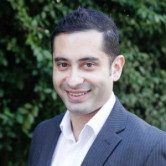 Media buyers have privately told AdNews they were shocked by the size of the discrepancy and that it casts doubts over the reliability of Facebook’s audience tool in media planning. Regardless, they are reliant on Facebook estimates to a degree because you can only book media through its system. After reading about the problem in Australia, this week Pivotal Research Group analyst Brian Wieser ran similar tests to expose inflation in the US. This contributed to Wieser reaffirming a sell rating on Facebook shares. Wieser told AdNews what concerns him is the deception and how that could have a broader impact. “The headline number they provide in Ads Manager can have a misleading effect,” he said. “Those I spoke to were unaware of all of the possible caveats that go into the figures provided there. Facebook tells advertisers they can reach millions of millennials that do not exist in almost every leading economy, including seven countries in the G8, AdNews can reveal. In a study of 12 countries, nine had large discrepancies that amounted to a difference of 42 million 20-29 year-olds that Facebook claims it can reach, compared to official population figures. The discovery follows revelations that Facebook had exaggerated its millennials reach in Australia by 1.7 million, and that it was even more pronounced in the US.